The extend of my baking repertoire is using a pancake mix to make our GF pancakes. I buy every other baked good! This recipe looks so fun, though. I think my boys would get a kick out of it. I can’t eat zucchini (food intolerance). Can you suggest a replacement? Thanks! You could grate some yellow summer squash! Thanks Danita! Beets are the BEST natural coloring! Wow this is awesome! I never thought about making pancakes like this! I have done zucchini in brownies which was pretty good. I will have to try this out! Thank you for linking up! I know some people who would eat those just because they are pink! LOL 🙂 Always fun to make colorful recipes, isn’t it? Thanks for sharing! Haha, it is! Thanks Julie! 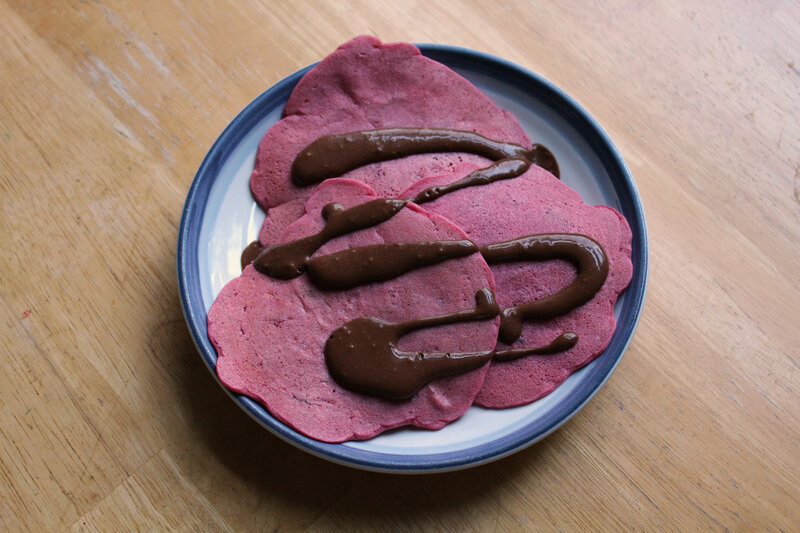 Great recipe and a very unique idea with the red beets in pancakes. They looks delicious and such healthy ingredients. thanks for sharing on Real Food Friday Blog Hop. Will pin and send to google. The first thing I thought when I saw these were “PRETTY!” They totally are. Wow. Love the pretty pink colour…guess that’s down to the beet. #TastyTuesdays. Wowzers! 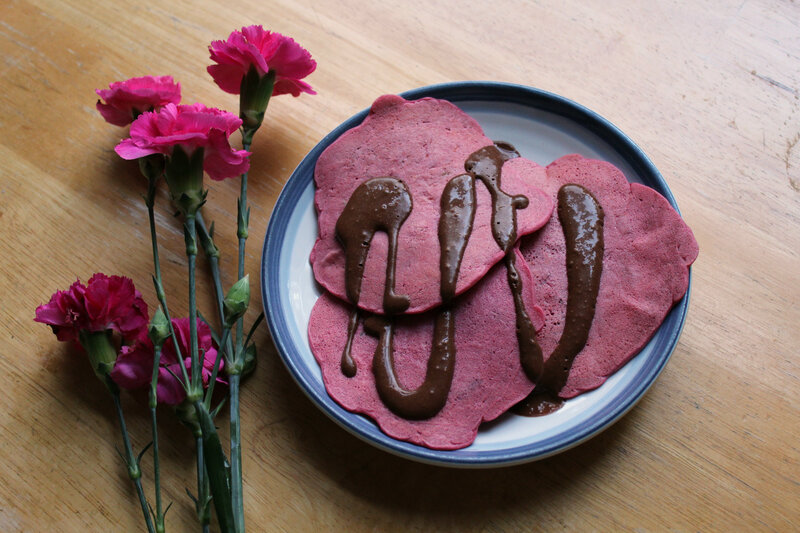 I have never added beets to pancakes before. And I certainly wouldn’t have guessed about adding chocolate, but somehow this just seems like it really works. Add to that my daughters favorite color is pink. So this is a real winner in my opinion. Haha, I bet your daughter would love these! Those are two surprised ingredients: beets & zucchinis! They look delicious! 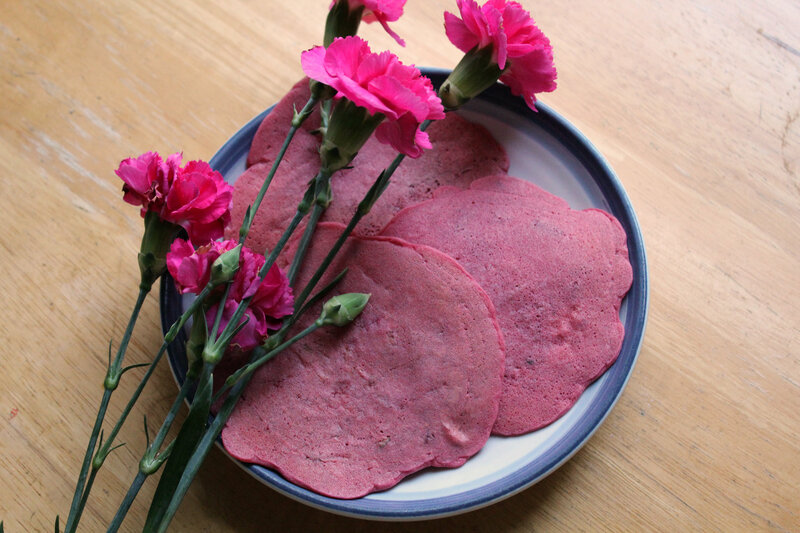 These really are beautiful and pretty looking pancakes. I love the pink color. Even more so, i do love the ingredient list. Do you know anoher flour that would work for the millet? You could use any! Just not almond or coconut! 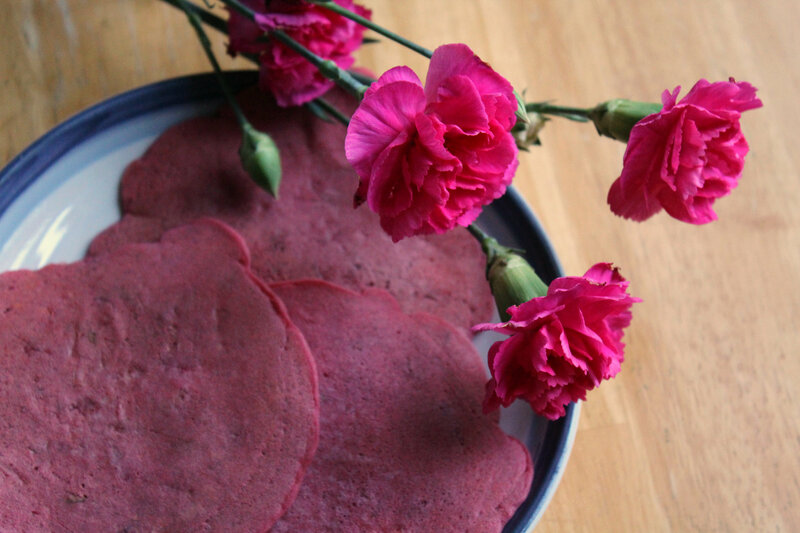 Your pink pancakes would also be great for a special valentine’s breakfast. Love ‘em. 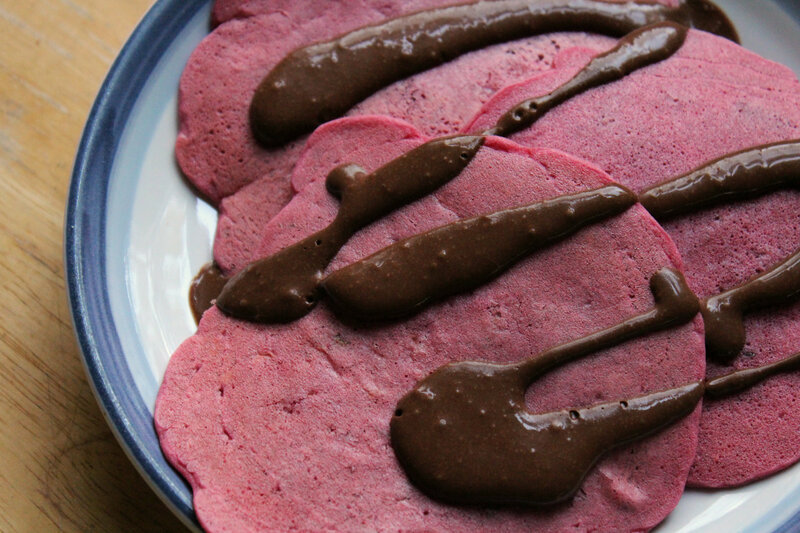 I love beets, too, but never thought to put them into pancakes. Would be great for Belgian waffles, too. Anything you want pink, just add beets! Wow! So gorgeous! 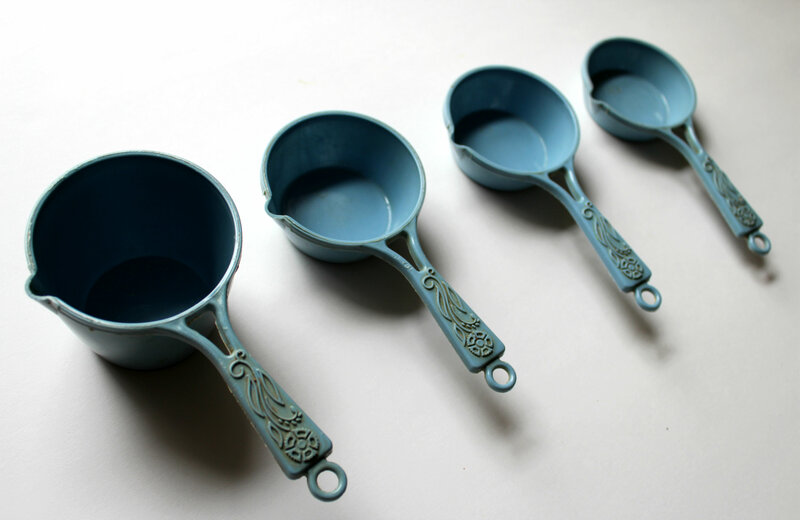 And those measuring cups… beautiful! Love those blue measuring cups! Sounds good, I’ve never thought of using raw zucchini or beats in my pancakes but what a great way to add some extra nutrients. Cute measuring cups! Thanks Sami! Veggies are the best addition to anything and everything!